Young Tiger NTR's Aravinda Sametha is set for a release on a grand scale tomorrow on 11th October. Audiences are eagerly waiting for this commercial mass entertainer, directed by Trivikram. 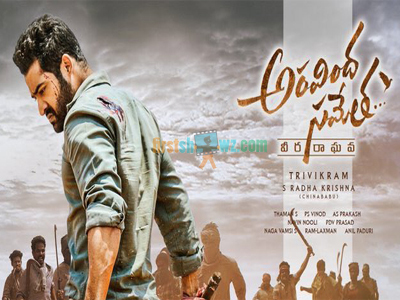 NTR is one of the top stars to rake in half million dollars opening with the premier shows at USA BO. His previous recent outings 'Janatha Garage' and 'Jai Lava Kusa' movies grossed $589 k and $584 k, and with Trivikram joining with NTR, Aravinda Sametha expectations are huge, and now the target set for the premier shows is 700k to 1 million dollars. The expectations are sky high and fans are eagerly waiting to see Aravinda Sametha New record. The advance bookings of premiers already gained $ 300k dollars. Let's wait to see few more hours if NTR reaches the target of 1Million Dollar Mark. Click here for Aravinda Sametha Movie Rating.